The Reverend Professor Andrew Dutney is installed as President on the first day of the 13th Assembly. 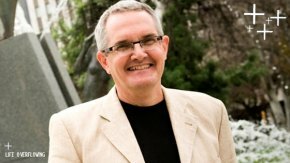 Andrew is the Principal of Adelaide’s Uniting College for Leadership & Theology and Professor of Theology at Flinders University. He is a leading interpreter of the history and theology of the Uniting Church, and is renowned for his passion for the Uniting Church’s founding document, the Basis of Union. Andrew is widely published on theology and ethics and is a well-known media commentator on ethics and spirituality. Committed to reconciliation between Indigenous and non-indigenous Australians. Passionate about sharing the message of God’s love for the world confident that the Gospel still has the power to heal and transform broken lives and societies. Celebrating and growing in our generational, cultural and linguistic diversity.